full brothers, For Romance I (licensing and main premium winner, top price of the Stallion Market, and Burg Cup finalist) and For Romance II (premium stallion) as well as Fürst Levantino and Fürst Jazz belong to the over 30 licensed sons of Fürst Romancier. Fürst Romancier was awarded the Oldenburg main premium. 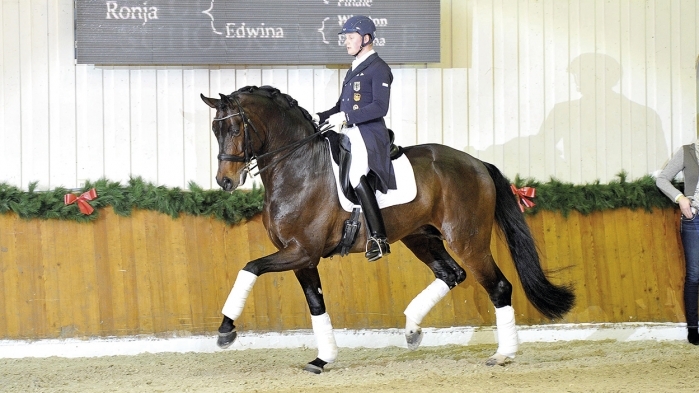 In 2009, he was fourth at the World Championships for Young Horses and at the German Championships, becoming the most successful stallion of his generation. His sire Fürst Heinrich, was Champion Stallion in 2001, winner of the main premium in 2002, World Champion of five-year-old dressage horses in 2003, and has produced 53 licensed stallions, including Fürstenball, licensing and main premium champion, German champion and elite sire. His dam produced two other S-level dressage horses, Scarlatti (by San Amour) and Freestyler (v. Fürst Heinrich). The dam sire Romancier, successful up to Prix St. Georges, comes from the Olympian lineage of Dodona, from which descend Rembrandt/Nicole Uphoff, Ahlerich/Dr. Reiner Klimke, Amon and Rubinstein. Fürst Romancier represents the very successful Oldenburg Edoste line, from which also descend German Champion and European Championship participant Exupéry, Reserve German Champion Landjuwel Gold, Olympic Grand-Prix horse Petit Prince/Ellen Bontje/NED, Grand Prix horse Avignon and the international show-jumping winners Questa Vittoria/Thomas Kleis and Quintera/Leon Thijssen/NED. Fürst Romancier is stationed at Deckstation Paul Schockemöhle in Mühlen.